We return back to Soleil to discover Hebridian whiskies with a masterclass session helmed by Brand Ambassador, Murray Campbell, and a whisky paired dinner. 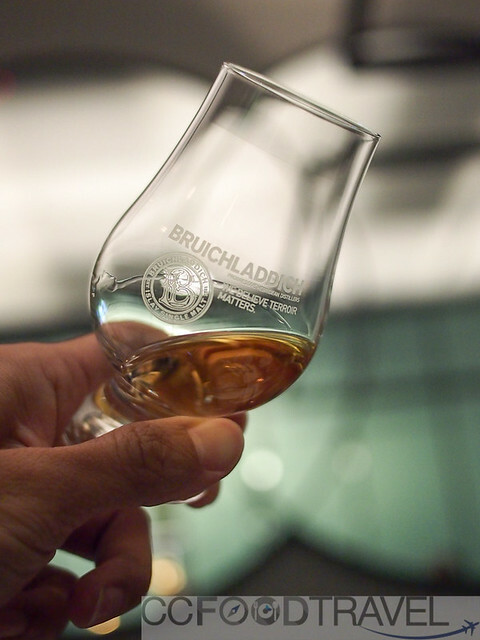 Ever heard of Bruichladdich Distillery? It is one of eight distilleries on the isle of Islay, Scotland. If you are familiar with The Botanist gin, they are from the same distillery. Built in 1881 on the Rhinns, the westernmost part of Islay, the Bruichladdich Distillery had once closed in 1994 only to be revived by some smart Londoners in 2000 who saw the potential in creating fine whisky by the old hands of the distillery using the traditional methods, equipment and with Scottish organic barley that’s only grown by a selected few farmers on Islay. 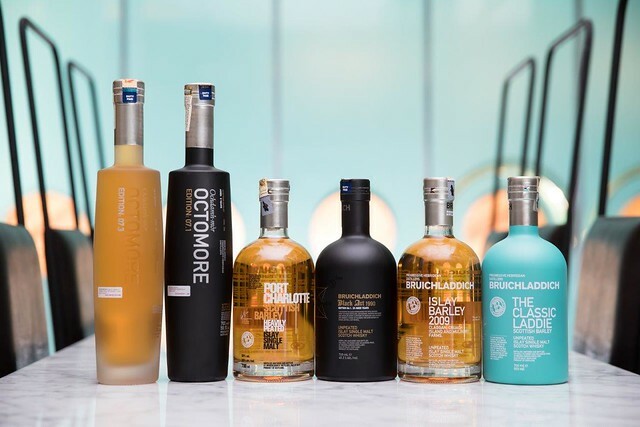 Bruichladdich brags their single malt whiskies are all natural, flavored with islay spring water, and they are also non-chill filtered so the oils and other byproducts from the distillation process are left on to add richer flavors. One of the key reasons for chill filtering is maintaining the clarity of the whisky when it’s cooled with ice or cold water. 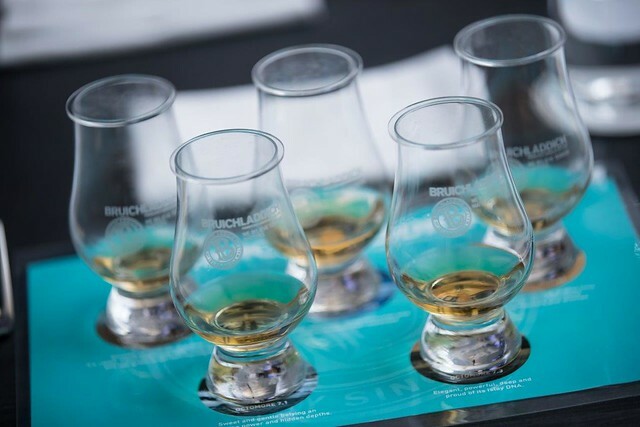 Bruichladdich single malt whiskies are all above 50% ABV which will maintain its clarity even when cooled down. Our tasting session had us swirling, nosing and sipping 5 labels from the boutique distillery. Islay Barley 2009, and Classic Laddie are unpeated making them very accessible to new whisky drinkers, and to those more matured drinkers, the whiskies offer complexity without the peaty flavor. For those that enjoy the deep, smoky, iodine tinged smell and flavors, Port Charlotte is peaty at 440 ppm while, Octomore 7.3 (latest release) and Octomore 7.1 are much more peaty at 169 ppm and 208ppm, respectively. Very seldom do I find whiskies blend in so smoothly with seafood let alone raw fish. 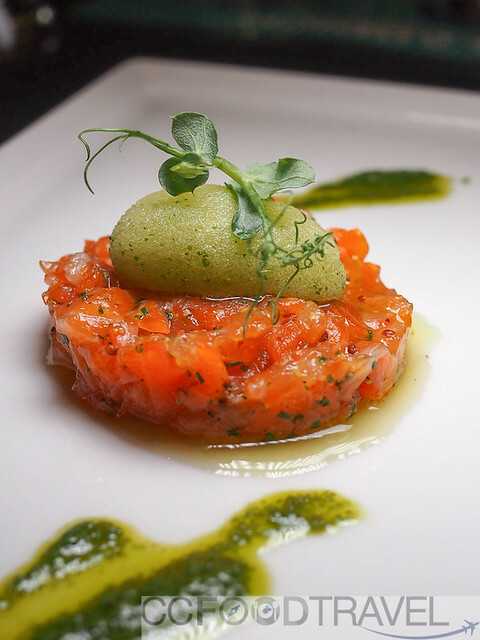 The Classic Laddie with its light, friendly notes of oak, matured green fruit and smell of the coast, collaborated well with the texture and ocean flavors on the dish. The calamansi sorbet adds a lovely dimension to whisky too. In hindsight, this was our favourite. Bruichladdicious! 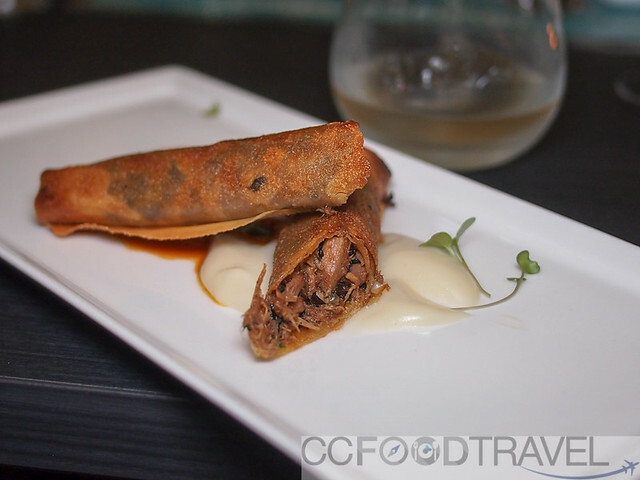 This luxe springroll was already just so delectable on its own. The Islay Barley is, as Bruichladdich states on their website “a young spirit that needs not the weight of oak to shine”. The 2009 vintage exudes notes and flavors beyond its age. As you smell and tasty the whisky, ripe berries and mangoes give way to malty sweetness and toasted oak so you can probably understand how and why robust flavors of duck would go so well with this yellow liquid gold. The whisky even added a note of sweetness to the dish. Lamb a flavorful meat that can only be matched with a bold liquor. Octamore 7.3 the latest release from the brand whoops a heavy peaty carbon aroma and blends in so well with the dish. Since we are not normally fans of super peaty whiskies, diluting the Octamore with water then allowing it breathe before taking in a few sips to accustom our palate to its phenolic, iodine aroma allowed us to appreciate more of its underlying multilayered flavors which ranged from apricot to spicy peach. 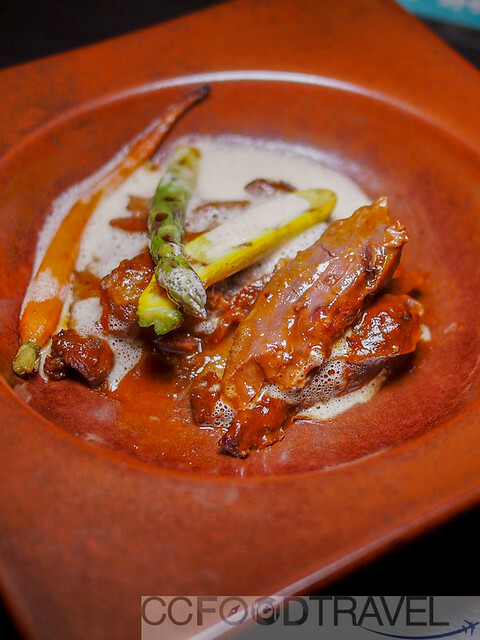 The finishing fructose notes lent a sweetness to the lamb shank which made the dish even more pleasant to dine on. Dark chocolate is always the best condiment with whisky. We nibble on chocolates with sips of our own whiskies at the homestead. 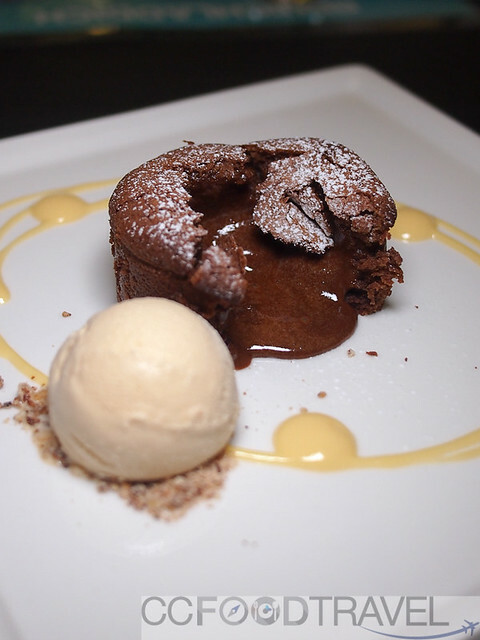 At Soleil, it is not a surprise to see this popular lava chocolate go down so well with fine whisky like the Port Charlotte. Whiff and sips of the whisky triggered the senses to project a sea breeze, spices, tobacco, toffee and walnut – a balanced whisky that wasn’t overwhelming in its medicinal aroma. It wasn’t just us, but all diners regaled later about how well the whiskies paired with the dishes. What a wonderful evening tasting superior Hebridean whiskies and having a delicious dinner prepared and served by Chef Evert and his team.